Do you love banana splits? My husband loves banana splits. I love all of the ideas out there for desserts that taste like a banana split. The dessert recipe below is super easy to make and you can serve it at any party! Would you make this banana split dessert? 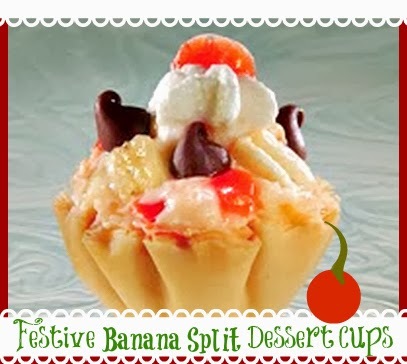 Do you have any banana split desserts on your blog? If so please share with me in the comments! In a medium bowl, use an electric mixer to beat whipped topping, cream cheese, instant pudding and powdered sugar until well blended. Stir in bananas and pineapples, mixing lightly. Spoon 1 Tablespoon of filling into each Fillo Shell. Garnish each with dollop of whipped topping and chocolate chips and top with a cherry half. This is a guest post recipe.